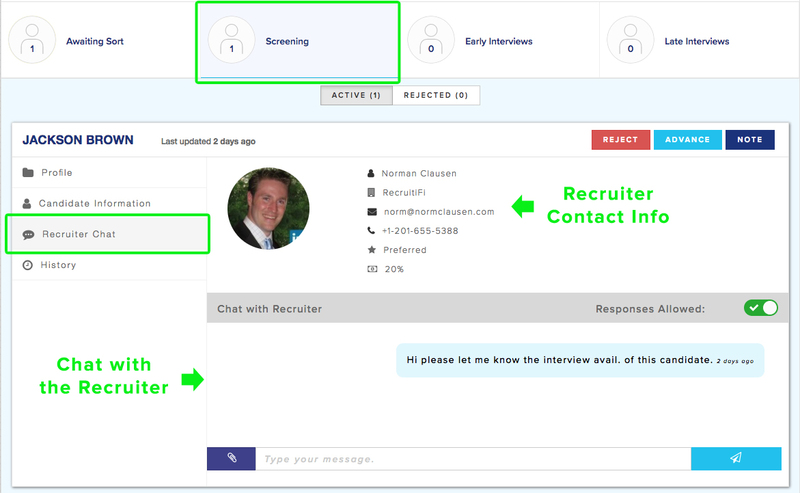 Candidates have confirmed interest in your JobCast, and are waiting to be evaluated by a member of your team. Here, the submitting recruiter will highlight the qualifications of the candidate as they relate to your predetermined "must-haves." 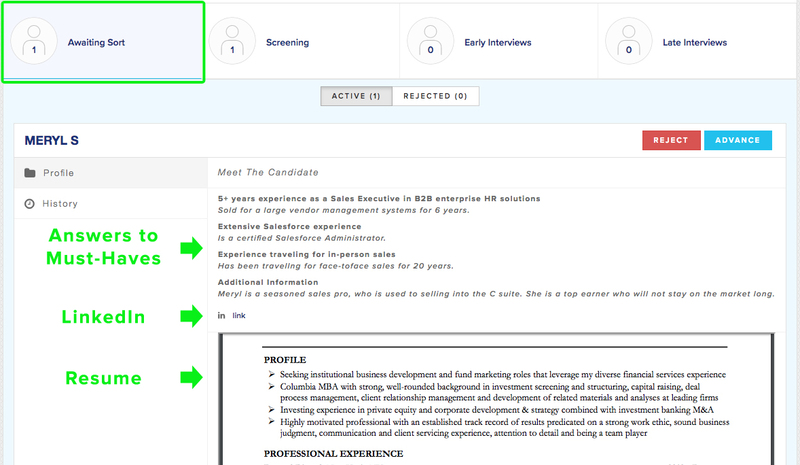 You will also have access to an inline view of their resume, so you can determine if you want to view the entire profile. Pro tip: Quickly reviewing new candidates as they arrive will help you maintain a good reputation. Once you've determined that the candidate meets the basic "must-haves," you can move them to "Screening." This will unlock two new sections. If you put screening questions in your JobCast, the candidate must complete them prior to submitting. This is where you'll be able to see their answers. You will also get additional information about them, like their full name, contact info, and expected salary. Candidates in this stage are being reviewed digitally for basic qualifications. While you can reach out directly to the candidate, we recommend handling scheduling, questions, and salary negotiations through the recruiter, as this will help you build rapport with the community, creating a deeper engagement for future JobCasts. If you choose to work with the recruiter, you can reach out directly via email or phone, but you can also contact them through our chat feature. Note that the chat allows for attachment of documents, so if you need an updated resume or a portfolio, the recruiter can send that to you directly through the chat. Once a decision has been made to conduct a phone screen or phone interview, the candidate should be advanced to the "Early Interviews" stage. Early interviews may take the form of a skills test, a Skype interview, or any other assessment that fits with your organization’s process. Pro tip: If you conduct multiple phone screens, say a cultural screening followed by a more technical screening, you can indicate this progression as a "Note" without advancing the candidate to Late Interviews. Candidates in "Late Interviews" are finalists for the position, with each being seriously considered on-site. Again while this stage may represent one or multiple interviews, it is imperative that all "Late Interview" candidates have the attention of the ultimate decision makers. This stage also includes background checks and outstanding offers. Candidates that are hired have completed all stages of the hiring process (e.g. a background check, signed offer, start date set). Rejected candidates are no longer being considered for this or any other position at the organization.